Hiring among U.S. employers may be picking up steam, but worker wages? Not so much. Employers expect to increase worker salaries by an average of 3% in 2015, only slightly better than the 2.9% hike they gave this year, according to human resources consulting firm Mercer. The good news: Employers say they're starting to realize that they must increase pay to retain workers, many of whom have more opportunities now than they did during the recession. 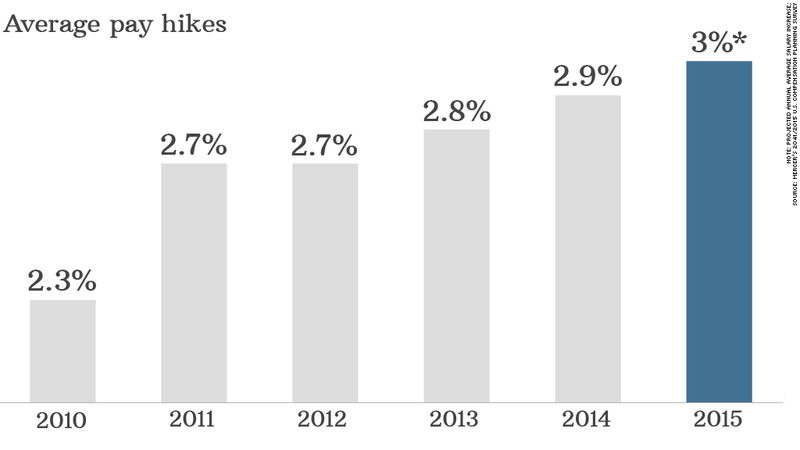 In 2009, when the unemployment rate hit 10%, pay rose by just 2.1%, according to Mercer. In July, unemployment hit 6.2%. "Companies are starting to see data telling them they have to raise their salary structure to keep up with the competition," said Mary Ann Sardone, a consultant with Mercer. Related: Cost of living calculator: How far will my salary go in another city? In the early 2000s, when unemployment fell into the mid-4% range, overall raises were more robust, averaging about 3.5%. Sardone said raises may never get back to that level again. Instead, companies are using bonuses or other incentives to reward and retain their employees. "They've gotten more creative about how to keep their best people," she said. Still, most of next year's pay hikes will go toward retaining top talent. Employers expect to give the top 8% of performers an average pay hike of 4.8% and the next 28% of performers a 3.7% bump. Average performers, who represent 57% of the workforce, are expected to see an average pay increase of just 2.6%. The next 9% will get 0.9% raises and the worst workers will get little-to-nothing, Mercer reported. Some industries plan to hike wages more than others, mainly in an effort to lure much-needed talent. The domestic oil and gas drilling boom, has created thousands of jobs for the energy sector, which expects to raise wages by an average of 3.5% next year. Non-financial services, like travel services providers or data storage companies, and consumers goods manufacturers, will offer workers the smallest wage increases, averaging 2.8%. Mercer also reported that pay freezes have become a thing of the past. Less than 1% of the 1,500 companies Mercer surveyed said they will not give any pay increases next year, down from 6.5% two years ago.